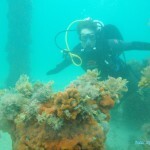 This is always a great dive site and today was no exception. There was so much action going on under the water it was hard to know where to look! When we arrived, Des Williams was on the pier putting a diver in standard dress into the water. 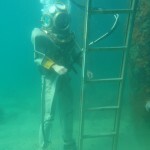 We were lucky enough to get into the water in time to see the diver walking along the sea floor. A fabulous sight!! We didn’t plan to dive as a group, but because the water was so clear, it was really easy to see each other most of the time. So when the seal appeared during the dive we all had a chance to swim and play with it. Rye Pier is becoming as well known for its Seahorses as Flinders Jetty is for its Seadragons. Big- bellied Seahorses were in record numbers. We must have counted in excess of 15. Another perfect dive……what more can I say?? ?